Shame, we have all felt it. However, the majority of people undermine how much it has shaped the world that we interact with everyday. Read from July 11, 2017 to July 20, 2017. Shame, we have all felt it. However, the majority of people undermine how much it has shaped the world that we interact with everyday. From our sexual behaviour, politics, self-worth, and even our upbringing. What is shame and what makes it different from guilt? For many scholars, this has been a broad and difficult definition to tackle and an even harder topic to discuss in terms of history and its impact on modern society. Peter N. Stearns attempts to address these grey areas with his new book which, is set to be published in September 2017. The novel opens with the widely debated matter of shame versus guilt and whether or not shame is a primal human emotion. In order to address the history of shame, the author breaks down the novel into four more additional chapters to address each stage in history and how shame is built and progresses through time. The author draws from a wide-variety of knowledge and cultures to provide excellent examples of shame from across the globe. The most impressionable chapter of the book was by far the last chapter which addressed shame in modern-day USA. The reason I felt this chapter was successful was that it was channelled and concise where as the previous chapters, while interesting and insightful, covered a globally large scope on shame. As a result, I also felt that the author missed out on key topics of shame, specifically with women’s sexuality and minorities, both historically and for our present day. While it was mentioned and discussed to a point, surely a large portion of how shame is structured and how it has created our current social and cultural society was built and carried on the backs of shamed women and minorities? Perhaps it is too presumptuous for me to suggest that, however, this book would have benefited from discussing the effects of shame within one country or continent, rather than that of the whole world. In the last chapter, the author also discusses how technology and social media has given rise to a revival of shame in the modern-day. I also appreciated the references and discussions that the author made in relation to other current researchers on shame, such as Brené Brown. Overall, this novel is an intriguing look into how shame has shaped our world over the years and how it is currently effecting our everyday lives. The majority of this book is historical in nature but there are also some good sociological and psychological insights as well. I would recommend this book for those looking for an academic read on a topic that is worthy of more exploration. A big thanks to Netgalley for providing me with an ARC copy of this book in exchange for an honest review. Originally published on July 10, 2014. Read from May 16 to June 15, 2014. A big thanks to Netgalley for an ARC copy of his book. Ever since grade 12 social studies and the animated movie Anastasia, the Romanov family has fascinated me. What makes this book unique and better than most historical non-fiction, is that it read more like a fiction. This book made the Romanov family real, made them look like a regular loving family which is not the portrayal history gives them. Nicholas is by far more remembered for events like Bloody Sunday than he is as being a supportive husband and father and dedicated family man. Alexandra is remembered for being sickly and outwardly cold toward the press when really she spent so much of her time and energy helping others and being a dedicated mother to her family despite what was expected of her in terms of being royalty. The family was brought together by love, as Alexandra and Nicholas truly loved each other and married for love and their children were well-rounded examples of their love and dedication to their family. The Romanov’s were executed in Yekaterinburg on July 17, 1918 at the peak of Russia’s first revolution, also know as the February Revolution. Russia was suffering economically and socially which was made worse by the outbreak of WWI. While the book is titled, the Romanov Sisters, it ultimately talks about the whole family. The Romanov’s were the celebrities of the 1900’s and everyone talked about them. 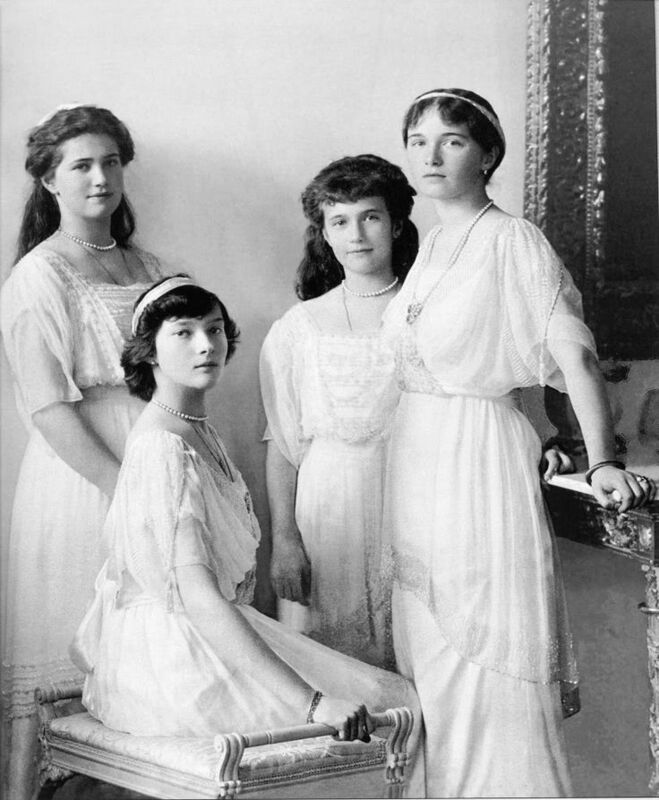 The Romanov’s had four girls: Olga, Tatiana, Maria and Anastasia. Olga was the oldest, being 23 when she was executed, Tatiana, second oldest at 21, Maria 19, and Anastasia at 17. This book captures the finer details of the girls personalities and intelligence. Olga was known for her religious piety, beauty and for being the most like her mother in personality, while Tatiana was known the most for her beauty out of all her sisters but was also a leader and took charge when her older sister was unwell. Both girls were highly desirable for marriage but their parents insisted they married for love. They both died unmarried. As the two of them were closer in age, they became a very close pair. Maria, was more broader built than her sisters but had a notoriously good nature and was very close to Anastasia. Anastasia, was known for her voracity, energy and charm. She was a bit of troublemaker but she had an amazing sense of humour and often made her family laugh. All four of the girls can be described as amazingly down to earth. They loved to get dirty and play as children. Their parents did not lavish them with expensive accessories, toys or furniture. The girls were polite, kind and well-rounded. I was surprised to learn that when the war broke out, all of the girls volunteered and trained as nurses to heal wounded Russian soldiers and spent the majority of their time in the hospital. Especially Olga and Tatiana. The did not want to be treated like royalty during these times and enjoyed connecting and talking with the soldiers. Even dreamed of falling in love with them. Another interesting fact about the girls, is that at one point, the girls all came down with measles, in which the medication they were given at the time caused their hair to thin and fall out. They all shaved their heads. The girls were so good-natured that it didn’t appear to overly bother them and quickly gave up wearing scarves to cover their bald heads.They were amazing role models and broke the mold of what it was be a Russian Princess. All of the girls were extremely well liked. Having five children took its toll on Alexandra, especially the pressure when she didn’t produce a male heir, Alexei, until her fifth and final birth. Alexandra was not your typical Tsaritsa as she wanted to be personally involved in the upbringing of her children. She breastfeed them and raised them, which was unheard of for a royal family member. Unfortunately, Alexei had inherited a medical condition from Alexandra’s family, hemophilia. This condition inhibits the body from clotting blood and so any minor bump, bruise or scratch and cause debilitating and life threatening internal bleeding. So Alexandra’s worry was never-ending. She was overprotective of her only son and it took a big toll on her own health, in which she would have to rely on her eldest daughter, Olga to look after him when she was unable to. This is also how the family because close with the notorious Rasputin. Both Nicholas and Alexandra were very religious and passed their faith onto their children. Rasputin was a religious mystic with a mixed reputation. Alexandra became desperate when Alexei experienced a major stint of painful internal bleeding in which, the doctor’s could offer no assistance. The world at the time did not know of Alexei’s condition and she was desperate to save her son. Rasputin was called in, he prayed and declared that the boy would live, which he did. There were many instances like this which caused the Romanov family to rely heavily on Rasputin for Alexei’s care. There were absolutely convinced that Rasputin was the only man capable. Alexandra especially believed that her son’s health and fate were tied to Rasputin’s religious gifts and would trust no one else’s advice, even if it was rumoured that Rasputin was not a good man out in his normal life. It was this relationship that started rumours about how much influence Rasputin had with the Romanov family. Strangely enough, Rasputin warned Nicholas of WWI, and begged him not to become involved as he believe that it would bring about their demise, which he was right about. Nicholas’ abdication of his throne was done largely for his family and to protect his son. Unfortunately this decision also ended up being his families demise as they were placed under house arrest by the Provisional Government. The family kept hope and tried to live life as normally as they could. The intentions were to protect the family from the rising revolutionaries but it quickly turned to wanting to put the Tsar on trial and then the whole family to death to ensure that revolution continued and that a support rally was not gathered. This book opened up how tragic the death of this family truly was. The children’s young lives ended so early when they had done no wrong, and parent’s that were doing the best they could while also trying to manage and run a country. The book was highly engaging and very interesting read and I highly recommend it to lovers of history for those intrigued by the Romanov family. Read from April 04 to 14, 2013. Anne Frank happened to live in a devastating era. For 2 years, Anne and her family were hidden in away in a Secret Annexe in order to keep from being sent off to concentration camps. Her diary is a depiction of this time. In so many ways, Anne is like a an ordinary teenager (though I don’t think teenagers these days write as well as her): Boys, struggles with her family, her self-image and explorations of her own sexuality, it just all happened to take place during the Holocaust. I can’t even imagine what it would be like to come of age during this time. I only wish that Anne had survived to further tell her story. I’m thankful that I read this book as an adult because it allowed me to truly grasp how horrible Anne’s situation really was. 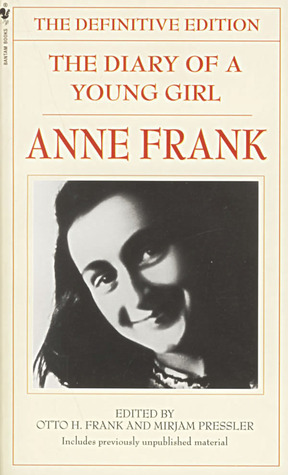 If I read this as a teenager I might have connected and likely focused on her struggles with her parents and her craziness about boys rather than seeing the big picture of the scenario she had found herself in, as Anne often tried to focus on things that were not directly related to the sorrows of her family too much. In some ways, if taken out of context, the diary could just be that of a normal teenager to some extent. You almost forget to atrocities going on outside of Anne’s thoughts until she reminds the reader of her situation. Anne grows up so much through out the writing of this novel, in an almost tragic sense, and she realizes that. She comments on her nativity and realizes that she will never again be that innocent child. She even at one point finally acknowledges the cruelty she has displayed to her parents. I’m also glad I read the definitive edition and that the publisher added an introduction with an explanation of with how her father handled her diary as well as the tragic ending of most of the people in the Secret Annexe. Speaking of the Secret Annexe, I can only imagine the boredom! I felt claustrophobic just reading this diary! Not being able to go outside for almost 2 years?! Really, sit back and think about that for a second… They couldn’t go outside. No exercise. No sunshine or wind on their faces. They didn’t have a TV or anything like that. Just books and paper. I admire that Anne and many of the members were still committed to learning. It gave them hope that there was future and that they would continue on living. I also adore how headstrong Anne is. She always spoke her mind, voiced her opinion and believed that women should be equal to men. A bold opinion in that day and age, especially for a teenager! I can imagine her, if she had lived, being a role-model and advocate to women’s rights and the survivors of the holocaust. I suppose her memory and the contribution of her diary does do this in so many ways. It’s just unfortunate that so many people like Anne were taken away from this world in such a cruel, unnecessary and horrific manner. Another tragedy of this, is the extent that Anne distanced from her own family during this hard time. It sounds like each person in the Secret Annexe felt very alone. I suppose that it’s normal for a girl her age to want to distance herself but I can’t imagine how hard it was on her parents. The scene in which her mother is crying and sitting by her bed and says something about how Anne doesn’t love her broke my heart. Living in the Secret Annexe would have been inexorably hard; living in fear inside a cramped space without basic necessities sometimes and ultimately feeling alone and without comfort… it just makes me cringe. I also can’t imagine the inner turmoil they all must have felt too, as Anne describes at one point as well, about feeling miserable about their situation but knowing that they are still one of the lucky ones, as their friends and neighbours are killed and shipped off to concentration camps. The people who assisted everyone in the Secret Annexe are remarkable human beings. The amount of times and the extent of how often they fell ill showed the extent of the massive amounts of stress that they dealt with trying to keep Anne and her family safe. Even at the risk of their own health and life, they still continued to protect the families in the Secret Annexe. Overall, I’m thankful I found time to read this classic. It’s an important piece of literature that should never be forgotten.